GUIDELINES Pocketcards(TM) are multifold pocketcards containing society-endorsed, evidence-based treatment guidelines in a brief algorithmic format that is most preferred by practicing clinicians, quality managers, nurses, educators, and medical students. 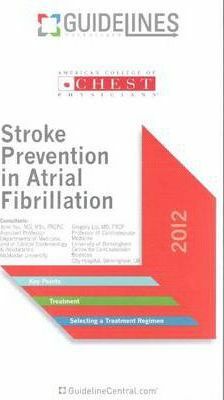 "The Stroke Prevention in Atrial Fibrillation GUIDELINES Pocketcard(TM)" is endorsed by the American College of Chest Physicians (ACCP) and based on the 9th Edition of "Antithrombotic Therapy and Prevention of Thrombosis Evidence-Based Clinical Practice Guidelines." This practical quick-reference tool contains a CHADS2 risk assessment, detailed treatment recommendations and summary by risk, and drug therapy with a list of approved agents including dosing information. It provides all that is needed to make accurate clinical decisions at the point of care including key points; CHADS2 score; antithrombotic treatment for AF with ACS, intracoronary stent, stable coronary artery disease, and a rhythm control strategy; cardioversion; mitral stenosis; antithrombotic treatment for atrial flutter; current medication tables with brand and generic names; and detailed drug information. Applications include point of care, education, QI interventions, clinical trials, medical reference, and clinical research. Introduction: Torching the 7 Myths of Leadership; The Leadership of the Outsider; Management Reborn; The Sharp Edge of Leadership; What Executives Do If Not Lead; The End of Primitive Leadership; Foster Leadership, Develop Executives; Kouzes and Posner on Leadership; Relationships: Women as Leaders; Character and Emotional Intelligence; Leading, Selling, Teaching; Organic or Mechanistic? ; Servant Leadership; Leadership With a Post-modern Twist. The American College of Chest Physicians (ACCP) is the leading resource for the improvement in cardiopulmonary health and critical care worldwide. The ACCP mission is to promote the prevention and treatment of diseases of the chest through leadership, education, research, and communication. International Guidelines Center (IGC) provides healthcare professionals with society-endorsed GUIDELINES Pocketcards™ that are current, practical, and portable. With over eight million copies in circulation, GUIDELINES Pocketcards™ are preferred by healthcare professionals worldwide for referencing guideline information at the point of care. IGC partners with over thirty medical societies and government agencies to provide quick-reference tools that physicians rely on for credible guidance in managing medical conditions.